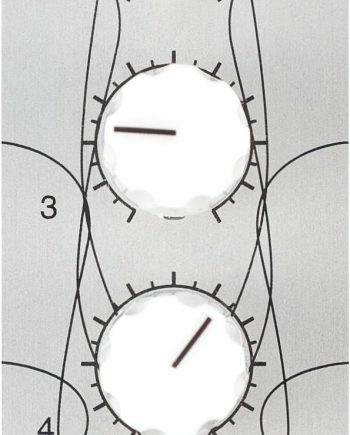 The 8 small LEDs surrounding the middle knob represent the number of bits being used (each LED represents 1 bit); as the knob is turned clockwise, more bits are added and more LEDs are lit. 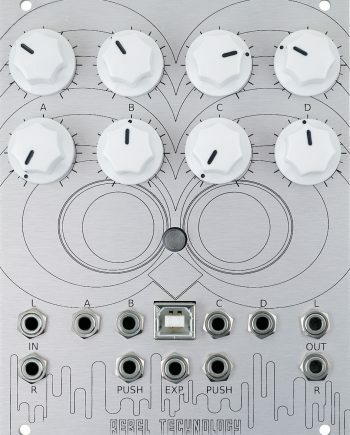 The sampling frequency increases as the knob is turned clockwise. At the fully anti-clockwise position the sampling frequency will be so low that virtually no note will pass through unscathed. Both of these parameters can be modulated via the CV inputs and the modulation depth is also adjustable for both parameters. Modulation is positive, meaning an increase in CV corresponds to turning the knob clockwise, and vice versa. Finally there is an input level adjustment to provide a small boost or cut as required to get the maximum tonal variance out of the bit crush. To fully exercise the dynamic range of a handful of bits the input should be high but not clipping. If the input level is low, there won’t be a marked difference when at the lower end of the bit knob. This can be demonstrated by taking a rather extreme example: at 4 bits, the output is stepped with a resolution of just over 300mV per step. That means that if the input level were 300mVpp, at 4 bits the output would already be a square wave (one step), exactly the same as when using 3, 2, or 1 bit. On the other hand, an input level that is too high could also be undesirable. The module’s input has a limiting circuit which caps the signal at 5Vpp. 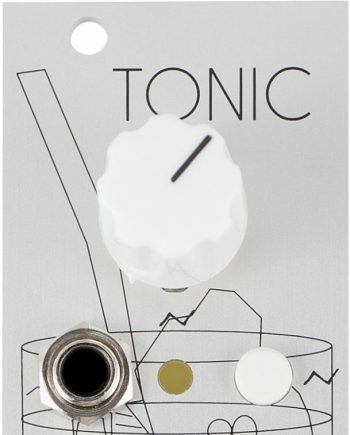 With an overdriven input this limiting circuit will already be distorting the signal before it even gets put through the analog-to-digital converter. The higher the input level, the more it will be distorted. There will be those amongst you, I’m sure, who will say ‘And the problem with that is..?’ However if the goal is to only colour the sound with the crushing/downsampling and nothing else, the option is there to cut the input down to size. The BitReactor is Open Source and Open Hardware, published under the Gnu GPL. The schematic is available here and the Bill of Material here.